You're about to write a nanny resume that will land you that nanny job. You know, the one with paid time off, health insurance, and your own car. 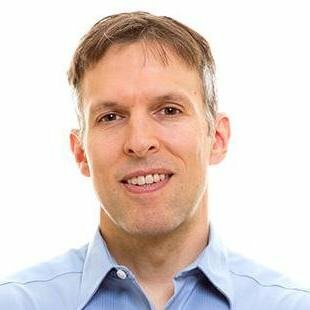 You're up against 300+ candidates. Most have great references, experience, and Mary-Poppins-level nanny resumes. But your resume will go above and beyond. Show your experience. Beyonce-style confidence. It will prove you fit the position like a custom-tailored Princess Elsa onesie. A nanny resume example better than 9 out of 10 other resumes. How to write a nanny resume that will land you more interviews. Tips and examples of how to put skills and achievements on a nanny resume. How to describe your experience on a resume for a nanny to get any job you want. Here's a sample resume for a nanny made with our online resume builder. Nanny Resume Example - See 20+ resume templates and create your resume here. What's the Best Format for a Nanny Resume? Those once-in-a-lifetime parents just hit "delete." Your perfect nanny resume is gone forever. Because you didn't use a professional nanny resume format. Parents want to know you'll pay attention to detail. Without it, you couldn't get a job nannying for the Bluths. 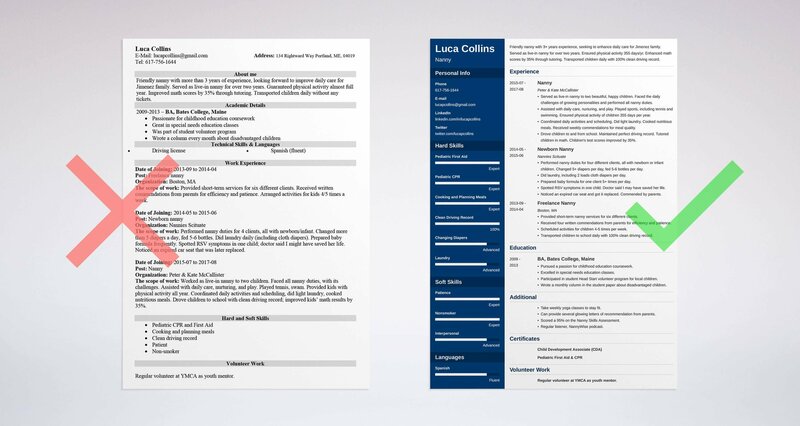 Use a trusted layout like the reverse-chronological resume format. Make good use of whitespace, eye-friendly headings, and clear, legible fonts. Last, save your great nanny resume as a PDF. MS Word resumes can scramble during emailing. Now, let's get on with how to make a resume for a nanny job. Pro Tip: Check the job offer to make sure PDFs aren't banned. Some applicant tracking systems don't play well with them. Want more format options for how to make a nanny resume? 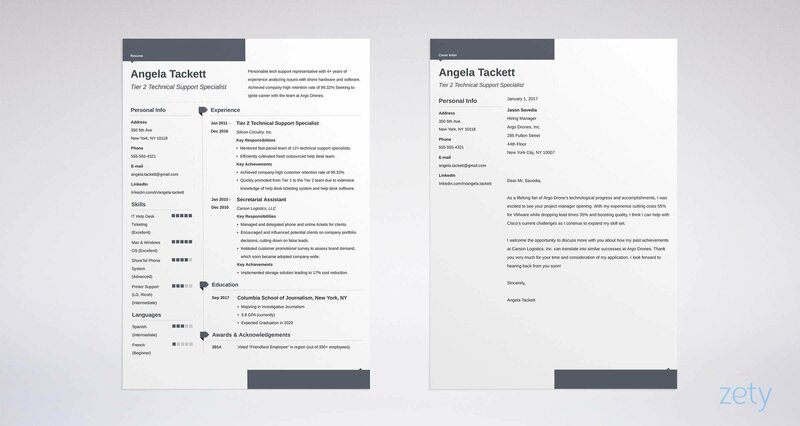 See our guide: "3 Resume Formats: How to Choose the Best One [Examples]"
Meet Karen and Steve. They're searching nannies for hire. The culprit is the cooing, smiling baby banging on the laptop. They're fantastic to work for. They're also reading dozens of nanny resumes. How can you make them spend more time with yours? A resume summary proves you're perfect for the nanny job with oodles of experience. A resume objective does the same by showing passion, even if you lack experience. See the nanny bio examples below. Compassionate, nonsmoker nanny with 3+ years experience. Seeking to enhance daily care for Jimenez family. Served as live-in nanny for over two years. Ensured physical activity 355 days/yr. Enhanced math scores by 35% through tutoring. Transported children daily with 100% clean driving record. Certified Child Development Associate (CDA). Engaged, efficient, experienced nanny looking for work. Have handled all nanny responsibilities, including daily care, cooking, laundry, etc. See that first one? Totally Mrs. Doubtfire. Chock full of measurable proof. Don't have that kind of experience? Write a nanny resume objective statement. If you're a newbie nanny, you can show your passion with an objective statement. Traditionally, those just state your goal. They don't show experience. Everyone has nanny experience. And anyone can get more, fast. Look at these example nanny resume bios. Compassionate, hardworking nanny with an abundance of patience. Have provided nanny care for six different clients. Received four written commendations from parents for efficiency and good-naturedness. Nonsmoker. Certified in CPR and First Aid. Big difference, right? That first nanny resume example could probably get you hired by the Huxtables. The trick is, the "experience" came from volunteer work and part-time babysitting. It took about a month while earning income. Pro Tip: Don't let your nanny resume summary or objective give you writer's block. Write it last, so you've got plenty of material. Let's say you're trying to get hired by The Incredibles. Your nanny resume will need to show experience finding invisible girls. It wouldn't hurt to add a history of keeping up with bullet-fast boys. But if you're applying to Hermione Granger's parents, you'll need to show resistance to magic spells. Plus, prove your knack for engaging with extremely brainy children. A resume that isn't custom-tailored to the job will get passed by like a public pool in February. List your last job first. Under it, add 4-6 bullet points that show accomplishments. But tie them to the job description for your nanny resume. Served as live-in nanny to two beautiful, happy children. Fulfilled a general nanny housekeeper description and performed all nanny duties. Assisted with daily care, nurturing, and play. Played sports, including tennis and swimming. Ensured physical activity of children 330 days per year. Coordinated daily activities and scheduling. Did light laundry. Cooked nutritious meals. Received weekly commendations for meal quality. Drove children to and from school. Maintained perfect driving record. Tutored children in math. Children's test scores improved by 35%. Served as live-in, full-time nanny for two years. Drove children to and from school. Yikes. That bottom one might get hired by Peter and Lois Griffin. But all it needs to get it dancing is a few measurable achievements. Now, what if you don't have experience? That's where it really gets exciting. Think you can't get nanny jobs without experience? First, you already have experience. You just don't know it yet. Troll your past non-nanny jobs for any nanny resume experience. Have you cooked meals for others? Done budgeting? Made schedules? Taught? Communicated? Those are all personal nanny resume responsibilities! Second, you can get experience to build a great babysitter nanny resume fast. Volunteer work for youth organizations like the YMCA, or preschools. Working for family, friends, neighbors. Also, check online forums where people ask things like, "How much do nannies cost?" or "What's the best way to find a nanny?" Those people are on the hunt for you. Provided short-term nanny services for six different clients. Received four written commendations from parents for efficiency and patience. Scheduled activities for children 4-5 times per week. Transported children to school daily with 100% clean driving record. Nanny Experience: No formal experience yet, but I'm ready to learn! Angelina Jolie would hire from that first creative nanny resume sample. But here's the trick: The same person wrote both resumes. Pro Tip: Never use a childcare resume for a nanny position. Comparing nanny resumes to child care resume examples shows important differences. Keep those parents reading with creative nanny resume action words. Can't think of any? Use ours! "+80 Examples of Resume Action Words for Every Profession"
You're a nanny. You don't need a college education. Right? It's true that education isn't crucial in a nanny resume. But not flaunting it is like having an UPPAbaby stroller, then only using it to carry laundry. Use nanny resume bullet points to prove you fit the job. Received a BA in History. That's pretty bland, right? It's cream of wheat when we need blueberry waffles with real maple syrup. Pursued a passion for childhood education coursework. Excelled in special needs education classes. Participated in student Head Start volunteer program for local children. Wrote a monthly column in the student paper about disadvantaged children. Wow. Suddenly you're Maria from The Sound of Music. But anyone can do that in a resume for a nanny. It just takes a little work remembering old accomplishments that fit the job. Ready for more creative nanny resume ideas? Let's dive into skills. Pro Tip: Your employer will do a background check on you. Return the favor! Check references, and trust your instincts. You can even have a friend go with you to the interview. Want your nanny resume education section to turn heads like Pippi Longstocking? See our guide: "How to Put Your Education on a Resume [Tips & Examples]"
Let's check back with our awesome parents, Steve and Karen. They're in a room with big, sunny windows. They're munching homemade coffee cake and poring through 300+ nanny resumes. They're looking for the right nanny skills and qualities. Only a few resumes will have them. Be one of those few. First, read the nanny resume job description. Highlight all the skills you see. Second, list them on your nanny resume. Add extras so you're not just pandering. Third, prove the skills by showing them in your experience and education bullet points. Let's say you're applying for an infant nanny resume position. It values newborn care, attention to detail, and prepping baby formula. You'll put those in your skills list, plus changing diapers and doing laundry. Performed duties of a nanny for four different clients, all with newborn or infant children. Changed 5+ diapers per day, fed 5-6 bottles per day. Did laundry, including 2 loads cloth diapers per day. Prepared baby formula for one client 5+ times per day. Spotted RSV symptoms in one child. Doctor said I may have saved her life. Noticed an expired car seat and got it replaced. Commended by parents. They're all there. Those last two infant nanny resume bullet points show attention to detail. With a formula like that, the Bradys will hire you if Alice ever quits. Let's get the ball rolling (and bouncing) with the nanny resume skills list below. If you do this, your professional nanny resume will be more popular than Goodnight, Moon. Read the job description carefully. Live-in nanny jobs need different skills from child caregiver resumes. Pro Tip: Is nonsmoking a skill? 89% of parents say they won't hire smokers. Yet most won't list it on a nanny resume. If you do, you're way ahead. Want to make your skills section behave? Use the nanny resume template at the top of this guide. Also, see this article: "+30 Best Examples of What Skills to Put on a Resume (Proven Tips)"
Remember our fantastic parents, Karen and Steve? They've narrowed down "the pile" to 30 nanny resumes. All show similar skills, experience, and education. Make it easy for them. Add some Supernanny "other sections" that show you're more than just a sheet of paper. Take weekly yoga classes to stay fit. Can provide five glowing letters of recommendation from parents. Scored a 95% on the 4NannyTraining.com Nanny Skills Assessment. Regular volunteer at YMCA as youth mentor. The creative nanny resume bullet points above show nanny skills and qualities. The yoga classes prove fitness. The Skills Assessment test shows you can handle nanny responsibilities. It also shows you're learning how to be the best nanny you can. Pro Tip: You don't need a license to be a nanny. But if you've got a CDA or other certification, showcase it in your perfect nanny resume. Drawing a blank for things to put in your professional nanny resume "other" sections? See our guide: "+20 Best Examples of Hobbies & Interests To Put on a Resume (5 Tips)"
Nobody reads cover letters anymore. Right? Correction. Nobody reads boring nanny resume cover letters. You know, the ones that go, "Hi, I'm Sue, I'm great, I'm looking for a job, here is my nanny resume." That letter might as well get eaten by the very hungry caterpillar. First, make it personal. Call the parents by name. Second, make it passionate. Share your excitement about the job. If you can learn a detail you like about the parents or referral agency, use it. Third, make it tantalizing. Add 1-2 accomplishments to whet the appetite. Fourth, use a call to action. That's as simple as, "I'd love to talk with you about your needs." Last, follow up. A thank you note a few days after you submit your nanny resume can put you top-of-mind. Pro Tip: Don't put references on a resume for a nanny. If you've got some shining ones, mention them in your bullet points. Want to see how this all works in action? Need a sample for your nanny cover letter? See our guide: "How To Write A Cover Letter [Complete Guide With Examples]"
You shared your contact info. But you didn't do it right. Now your nanny resume is in the rejects pile. We say "professional" because nobody wants KittyPlayFunJaegerBombz49987@yahoo.com watching little Dennis. The McCallisters have got it narrowed down to five live-in nanny resumes, including yours. But someone added a LinkedIn profile and Twitter handle. The parents check those out. They love what they see. The other nanny is hired. So, include your LinkedIn profile, Twitter address, and relevant social media hangouts. That way employers can dig deeper than your nanny housekeeper resume. Pro Tip: Tidy up your online presence. That tipsy pic of you in Cancun four years ago? That's not doing anybody any favors. Clean up your online presence.. Need more tips to write the best nanny resume since Jane Eyre's? See our article: "How to Make a Resume: A Step-by-Step Guide (+30 Examples)"
You're making the switch to a "real job." So, you're not writing a nanny resume. But you don't get hired, because they think you were a "babysitter." You need to know how to make nanny sound good on a resume. So, here's how to include nanny experience on a resume for non-nanny jobs. First, look at the job description. Write down all the duties, skills, and responsibilities you see. Then, do a little head-scratching. When did you do those in nanny world? Finally, in the nanny job description, add resume bullet points that prove your chops. Performed daily scheduling of all activities. Included two physical and two intellectual activities per day. Planned and cooked meals, conducting avid nutritional research. Maintained clean driving record while navigating busy city streets daily with young children. Maintained constant communication and collaboration with two demanding parents. Received frequent commendations for efficiency and thoroughness. That's how to list nanny on a resume. Pro Tip: Don't call yourself an "Au Pair" if you're not. It's not another word for nanny on a resume. "Governess" is a fancy word for nanny, if you must. Knowing how to add nanny experience to a resume comes down to fitting with the job description. For pointers, see our guide: "6 Tips on How to Tailor Your Resume to a Job Description (Examples)"
Start by looking at the job description. Highlight all the nanny resume duties and responsibilities and use those keywords on your resume. Open your resume with a resume objective or summary. Show off your best skills. Prove your cred in nanny resume bullet points. Show measurable accomplishments. Add other sections to show your human side. In a resume for a nanny, that means interests, hobbies, and other extras. You need to prove you fit the job like Spiderman underoos. Do you have questions on how to write a resume for a nanny job? Not sure how to describe your skills or achievements? Give us a shout in the comments! We'll answer as soon as we can! Jobs for stay at home moms aren’t hard-to-get. They’re 1000x easier than giving birth or handling a billion tantrums. See 61 SAHM jobs here and tips to get one quick.